How did a Balkan country smaller than the American state of Connecticut end up with the mysterious and monumental name Montenegro? Although the origin of the name Montenegro is still debated among historians, it can be traced as far back as the early 1200s, when “Crna Gora” (“Black Mountain” in Serbo-Croatian) was used in the charter of Vranjina Monastery to denote the highlands of Mount Lovćen, a mountain by Kotor in southwestern Montenegro. That the country is known today by the Venetian calque “Montenegro” rather than the Serbo-Croatian “Crna Gora” reflects Venice’s dominance over the Balkans during the Middle Ages; what is now the coast of Montenegro and parts of Albania was under Venetian control between 1420 and 1797. Perhaps we will never know exactly why the area was in the first place called Crna Gora or Montenegro, but one our favorite origin stories comes from the Middle Ages, when the Venetians traded with independent city states along the Adriatic. Kotor, one of these independent city states at the far end of the Boka Bay, a winding body of water connecting the Adriatic to the town, was the only passageway into today’s mainland Montenegro. Once they had arrived in Kotor, the Venetians had to cross the city walls behind Kotor and travel up and over Mount Lovćen to reach Cetinje, at that time the capital, which was located at the foot of the mountain. The Venetians would therefore, in speech, refer to today’s mainland Montenegro as the place over the dark mountain; the pine forests on Mount Lovćen were apparently so dense that from far away the mountain looked black. 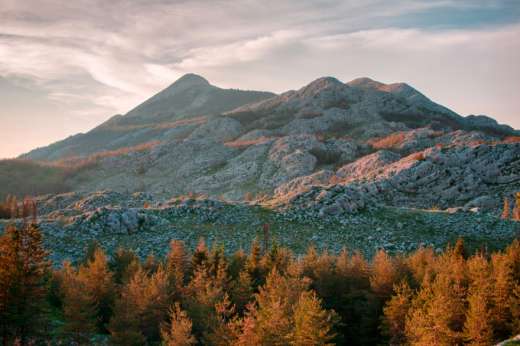 Mount Lovćen: the black mountain that, according to some origin stories, gave Montenegro its name. Photography by Luka Bošković.